testng.xml is the main configuration file that defines the suite and tests. suite is top level element in TestNG configuration file and is defined by one XML file. If you need to have more suites then you need to define separate testng.xml file for each suite like database_testng.xml, feature_testng.xml, performance_testng.xml etc. suite is the first element of testng.xml. A suite contains one or more test elements. A test is made of one or more classes and a class is made or one or more methods. 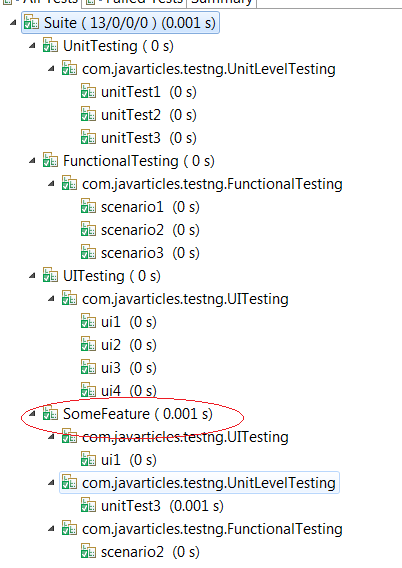 In this example, I have three tests UnitTesting, FunctionalTesting, UITesting and SomeFeature. UITesting is meant for blackbox testing. Class UnitLevelTesting contains three test cases unitTest1, unitTest2 and unitTest3. unitTest3 belongs to group someFeature. FunctionalTesting contains the configuration methods like @BeforeSuite, @AfterSuite, @BeforeTest, @AfterTest, @BeforeMethod and @AfterMethod. It also contains couple of @Test methods, one of them belongs to group someFeature. In a UITesting class, test method ui1 belongs to group someFeature. The test configuration has all the levels of testing UnitTesting, FunctionalTesting, UiTesting and the feature level testing SomeFeature. Since fetaure someFeature has tests in all the three classes, the <classes> contains all three level of test classes.